Lumbar nerve root blocks are useful in the treatment of lower back and lower limb pain. This type of block is particularly effective in patients with radiculopathy and has diagnostic value in identifying the responsible nerve roots. Lumbar nerve root blocks may be placed inside or outside the nerve sheath. In most cases, the former causes radiating pain, whereas, in the latter, this pain is minimal. Radiating pain is severe when there is severe inflammation. 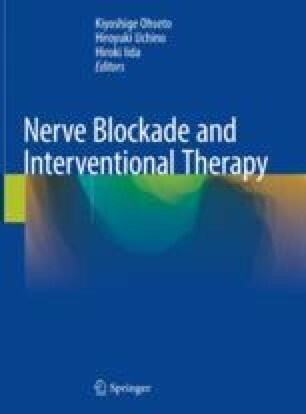 Although nerve sheath blocks are useful as diagnostic blocks, and as blocks during radiofrequency thermocoagulation, severe pain may often hamper subsequent treatment. In recent years, techniques that result in less radiating pain have become prevalent. Lumbar nerve root blocks are performed exclusively under X-ray fluoroscopy-guided method.